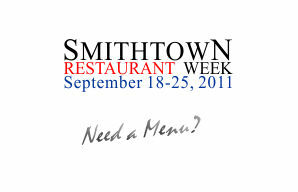 Tags: smithtown restaurant week, smithtown, restaurant week, prix fixe, pre fixe, long island, restaurants, dine, dining, special, specials, dinner. suffolk, commack, st james, hauppauge, kings park, nesconset. for $25pp (plus tax & gratuity). Selected wines will be offered at discount. See menus or call for details. A complete list of restaurants at link below.